When the season changes from Summer to Fall I get a craving for scrumptious pumpkin. Pumpkin runs a close second to Honeycrisp apples as my favorite fruit. I love everything pumpkin – pie, muffins, pie and more pie. As with my Fantasy Fudge, I bake many pumpkin pies throughout the holiday season. Pumpkin pie is my breakfast of choice. Heated up with a little whipped cream – it is all fruit and dairy – yum! Recently, when I needed a quick breakfast treat for a community tennis round robin, I decided against taking pumpkin pie. This is my guilty pleasure and better to keep it to and for myself (and now the blogosphere!). 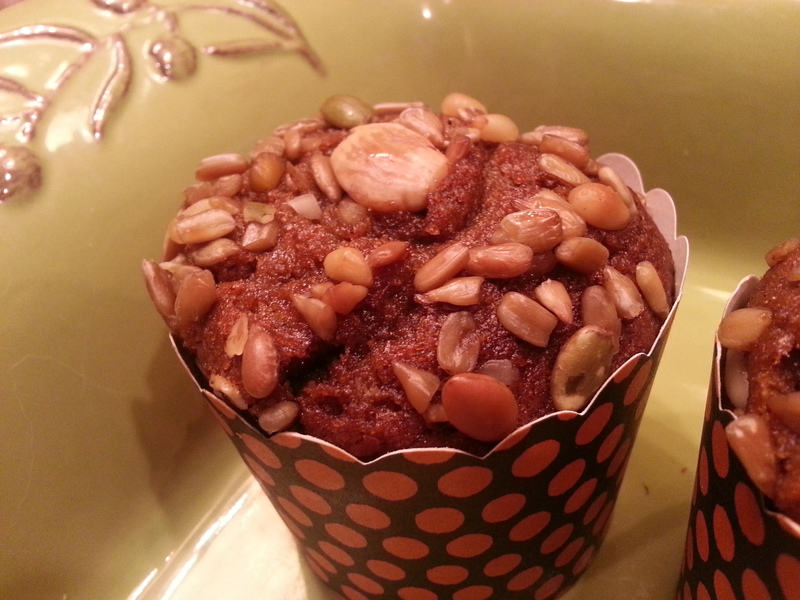 I wanted to take something pumpkin so I visited the Libby’s website for some inspiration and found a recipe for Libby’s Pumpkin Muffins. The recipe, provided below, is so simple and easy and with a bit of embellishment suits my taste buds and satisfies my pumpkin craving! PREHEAT oven to 350° F. Paper-line or grease 30 muffin cups. NOTE: I love to use decorative paper baking cups. They come is small, medium or large. I used large. COMBINE flour, pumpkin pie spice, baking soda and salt in large bowl. Combine sugar, pumpkin, eggs, oil and juice in large mixer bowl; beat until just blended. Add flour mixture to pumpkin mixture; stir just until moistened. Spoon batter into prepared muffin or paper baking cups, filling 3/4 full. 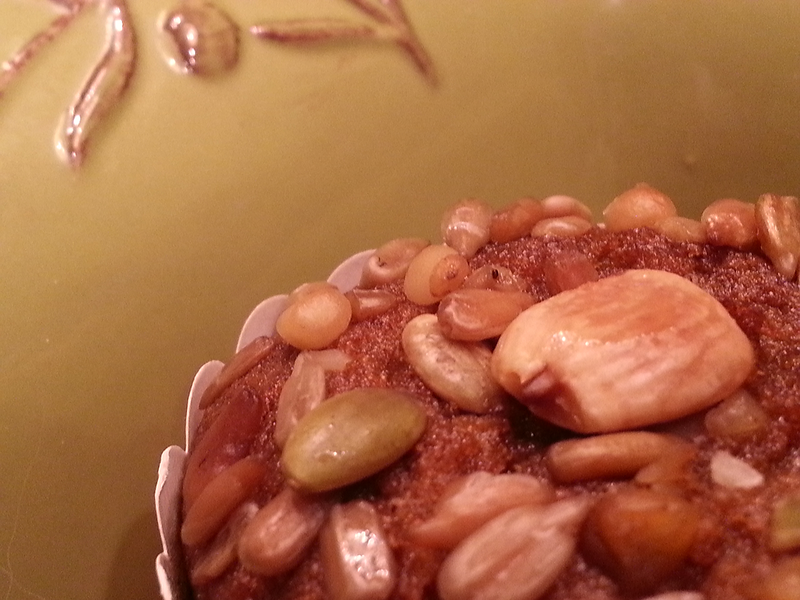 SPRINKLE nut and seeds on top of batter in cups. 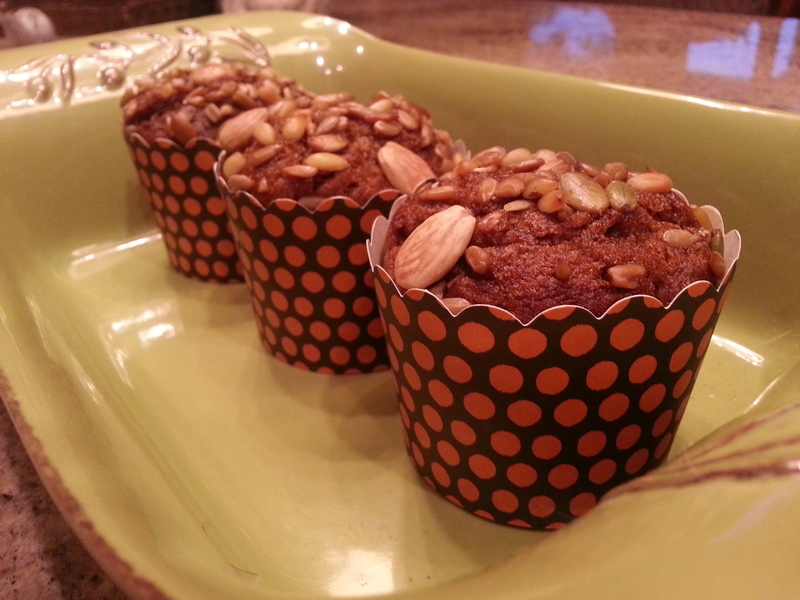 And the pumpkin muffins are delicious – moist and full of all that pumpkin-y flavor! My tennis friends loved them. And so will you! P.S. For other holiday ideas take a look at my other pumpkin project. Another good recipe to try. Thank you!